Oh, how I love these raw chocolate morsels. They contain basically walnuts, dates and cacao powder — no additional oils — and are so delicious, surely they are what is meant by the phrase, "the whole is greater than the sum of its parts." As I've previously mentioned, they come from the recipes of Jennifer Cornbleet. I found the recipe in Raw for Dessert, but it appears in different forms in her other books as well. 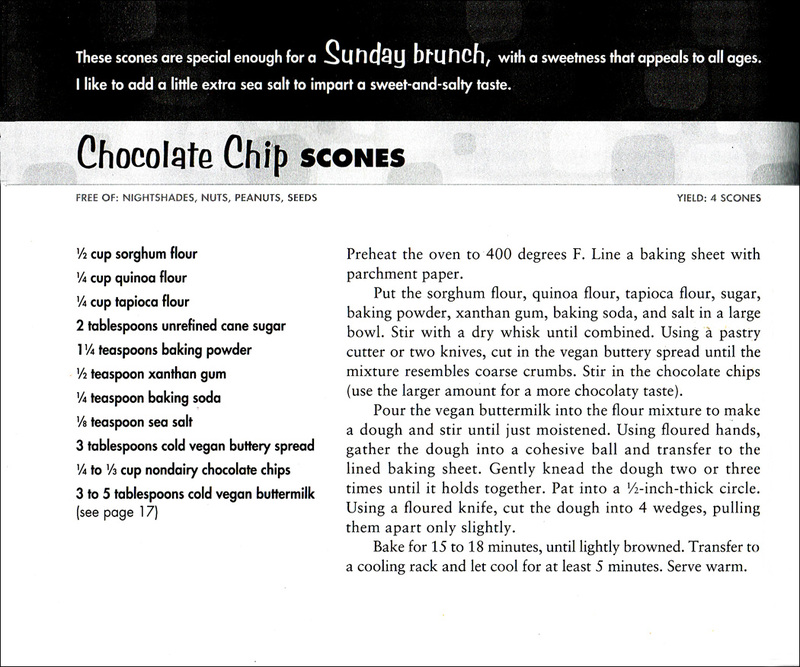 I recommend buying this little cookbook (reviewed here), but in the meantime, I've found the recipe for you online. Jennifer makes the chocolate dessert as a cake, and as cupcakes, but my favorite way to use it is in small chocolate molds. I have two molds, each with 15 cups, each one-inch in diameter and one-half inch deep. Pressed firmly into each cup, the recipe makes exactly 30 morsels. You could also easily form it into balls. I added five to eight drops of liquid stevia to my mixture because I was afraid it might be too bitter for my guests, and I also upped the vanilla to one teaspoon. I didn't use frosting. To find the recipe, follow the link to the Chocolate cupcakes recipe page, and click on "chocolate cupcakes." And if that isn't enough, I'm including a video of Jennifer making a larger quantity (in her cookbook the ingredients are exactly doubled for a cake) and forming the mixture into a cake with raspberries on top. 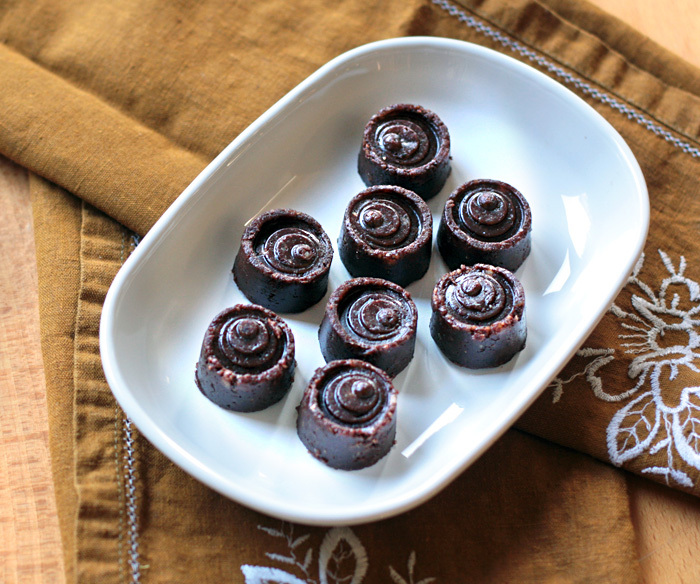 I used Dagoba fair trade certified cacao powder to make my chocolate. The growing, harvesting and manufacture of chocolate is fraught with corruption, slavery, and even murder. As a consumer, I want to make ethical choices to support companies that sustain, not damage and abuse their workers. But it's harder than I thought. If you read through the following information, you'll see that Dagoba is on the "not recommended" list because they source some of their chocolate from the Ivory Coast, the area most infested with abuses. In researching the chocolate issue, I've found other lists, and they don't all agree. It's complicated, but we can all make an effort to learn more about the food we eat, and try to make better choices, because our purchases have a global effect. 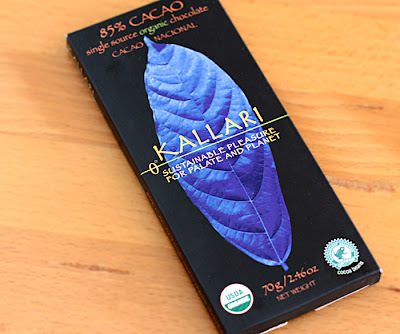 - There are a number of fair trade companies that are serious about sourcing their chocolate ethically. - The majority of organic chocolate is grown in Central and South America where slavery has not been an issue. Because of the limited supply of organic chocolate, most farmers receive a fair price. - There are a select number of farms in West Africa who receive a fair price for their chocolate and are slave and child labor free. If you’re confused now about which companies to trust you’re not alone. For some, refusing to buy chocolate from companies that source from the Ivory Coast – no matter their certifications or promise of due diligence – is the only option. Other consumers choose to buy chocolate from the select companies that are attempting to address the slave trade issue directly. These companies purchase their supplies from farmers or farming co-ops on the Ivory Coast who do not participate in the slave trade. Below you’ll find a list of companies in both categories, so the decision is up to you. On the recommended list and fabulous. "Generally, if the chocolate is organic, has a fair trade label or the cocoa is listed as being sourced from anywhere other than Ghana or The Ivory Coast then it’s slave free." After expressing my chagrin and surprise at Rescue chocolate not being on the "recommended list," an equally surprised friend said this, "Anyway, I read about Rescue Chocolate's stance on fair trade and chocolate sourcing on their FAQ page, and then I read more on the Food Empowerment's web site about what it means to be on each list, and then I emailed Rescue Chocolate and told them I was confused and to please explain. We'll see what they say." Here's an excerpt from what they said, "I'm not quite sure how the Food Empowerment Project decides to put companies in its various slots. They used to have us in the un-recommended slot. I contacted them and explained how we use couverture from Callebaut, which really is completely responsible in its production processes around the globe. That prompted the FEP to move Rescue Chocolate up a notch, but not any higher. I can only theorize it is because my labels do not carry a fair-trade logo (for the reasons you saw on my website). I would stop producing Rescue Chocolate in a heartbeat if I thought there were human beings harmed or exploited because of it. Even though Rescue Chocolate's mission is to help animals, I happen to believe that we are all part of the same web of life." If your favorite chocolate is on the "wrong" list, write to them for clarification. If they believe they are being misjudged, they may give you the information you need to make a decision to continue to support them. In any case, they will know that their customers care about the integrity of the companies that get their money. At a recent family dinner, I served something I haven't made in years, and consider a little retro — stuffed peppers. Do people still make these? Maybe I'm just out of touch because I'm not that fond of peppers, and don't cook with them very often, but I have to admit, they were good. The peppers were served at a holiday meal alongside potato kugel, cranberry-apple sauce and a large salad, and preceded by smoky cream of broccoli soup. I also made the delicious Silky Chickpea Gravy from Appetite for Reduction. I can't give exact measurements for the quinoa filling but will tell you everything that was in it, and how it was made; there's lots of room for improvisation. The leftover filling, baked in a separate casserole dish alongside the peppers, was used as a side dish, and tasted great on its own, minus the pepper. I started with 1-1/2 cups of raw quinoa which was cooked in three cups of low-sodium broth. Several chopped carrots, a few ribs of chopped celery, many sliced mushrooms, and a large chopped onion were stir-fried until nearly cooked, then pulsed in the food processor until they were finely chopped but NOT puréed. The vegetables were mixed into the quinoa along with 1/2 cup of shelled, roasted but unsalted pistachios, about 1/2 cup of chopped kalamata olives, salt and pepper. This should be enough for six large peppers. The peppers were halved, seeded and gently steamed until they began to soften. 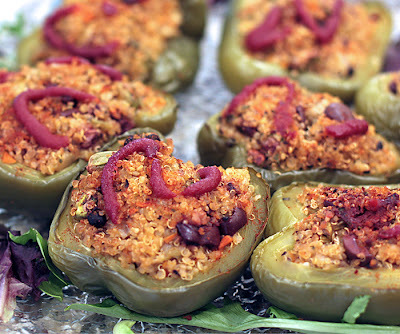 The stuffing was pressed into the peppers, carefully filling all the cavities and mounding over the tops. 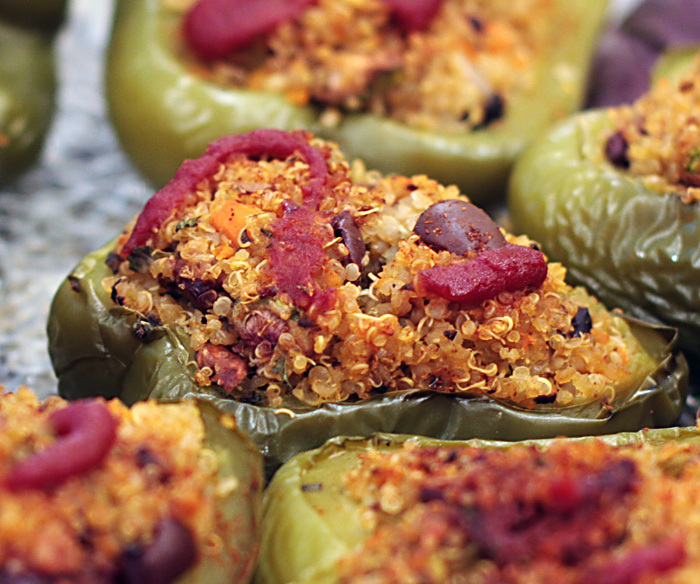 The stuffed peppers were then loosely covered, and baked at 350˚F. They were garnished with a bit of ketchup because I hadn't gotten around to making the tomato sauce I'd thought about. The quinoa tasted fabulous, and I will make it again as a side dish, or as a stuffing for collard leaves if I'm feeling more ambitious. I just don't like peppers that much. 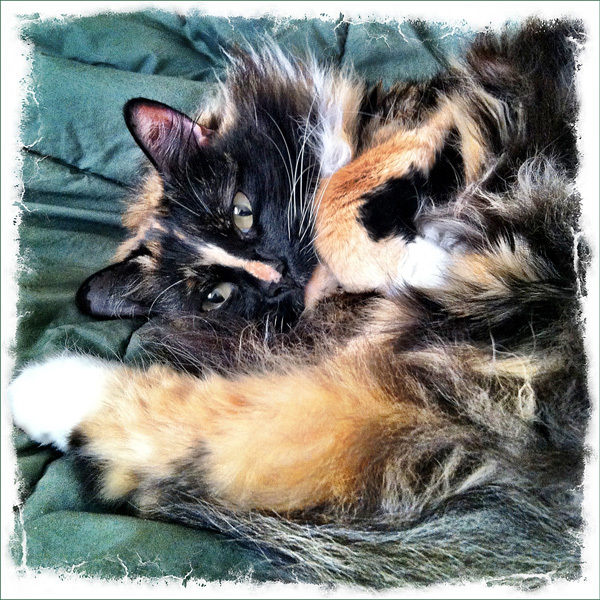 Here's a cute photo of our cute neighbor, Lucy, curled up on our bed. Did I say "cute" too many times? Lucy comes to visit often, and seems to think she lives here. What she doesn't know is if she lived here, she wouldn't be allowed to roam around outdoors. She's the nicest cat anyone could wish for — so loving and sweet. And very cute. After perusing all the tempting recipes in The Allergy-Free Cook Bakes Bread, and having a tough time deciding what to make, I finally decided that since I had tried a yeasted pizza dough that served as the base for a savory taco pizza, I should also try something in the sweet treat category. The English muffins I was eying would have to wait until I made chocolate chip scones. I remembered fondly my pre-GF scones, and wondered how these would stack up. I was pretty excited since I was still stoked by the success of my first recipe from the cookbook, but I'm still at an early stage of GF baking, and never sure how something I'm making will turn out. Will they taste like scones? Will the batter be hard to handle? Will it be gritty, sandy, gluey? The scones exceeded my highest expectations and tasted exactly like ... scones. The crumb was delicate and, dare I say, almost flaky. They were lightly sweetened, exactly the way I like. My husband felt that something was lacking in the flavor, but I disagreed. It's possible that the little mistake I made while preparing the scones had a subtle effect on the taste, however, I think when I make them again, I'll add vanilla extract for a little added depth. We cut the scones in half because they were a little big for us, but if you want eight pieces instead of four, I suggest waiting until the scones are baked before making the extra cut. They will be a lot easier to handle. Scones cooling on the rack. Because there are more ingredients involved with GF baking, and because I can be a bit scatterbrained, I've devised a method to make sure I add all the ingredients to a recipe. I place every ingredient in the recipe on the counter, and as I measure and add each one to the bowl, I place it back into the baking cupboard, which happens to be right next to my work surface. Thus I was busily employed at the point where the dry and wet ingredients combine were about to combine, when my husband rushed into the kitchen all excited about something. I got distracted, and tried to answer his questions until finally, I placed my attention back on the bowls. I combined. I patted out the dough into a round shape. I admired my work. But something wasn't right, and I had an aaarrrgggh moment as I realized the chocolate chips still sat on the counter. A couple more aarrghs while I considered what to do, then I spread the chips over the top of the dough and gently but firmly pressed them in as best I could. I tried to keep the dough from flattening more but I'm sure my scones were patted down a bit more than required. Still, they came out great. I wonder though, if my husband would have liked the flavor better if the chocolate chips had been better integrated. Notes: 1) Instead of using a pastry cutter or knives, I pulsed the fat into the grains with my food processor. 2) To make the buttermilk called for in the recipe, place two teaspoons of cider vinegar into a measuring cup and add five tablespoons of cold nut, seed or soy milk. Allow to stand for about 10 minutes. Use as little as you need to create a cohesive dough. I had to use it all. 3) You may want to add a teaspoon of vanilla extract to the wet ingredients. 4) The scones taste best after about five minutes of cooling. They aren't as good after they sit around for a while. Thanks to Book Publishing Company for allowing me to publish the recipe. Full disclosure: The cookbook was provided free to me by Book Publishing Company. I was under no obligation to write a favorable review, or any review. I received no money nor promise of monetary gain. I am not an affiliate of this company. All opinions are my own. The recipe I printed above calls for vegan buttery spread, and I want to alert you to Bryanna Clark Grogan's new recipe for homemade buttah. It is both palm oil-and-coconut oil-free. She provides extensive information about not only how to make the butter substitute, but why she chose the specific ingredients she used, and why palm oil is having such a negative impact on orangutans. 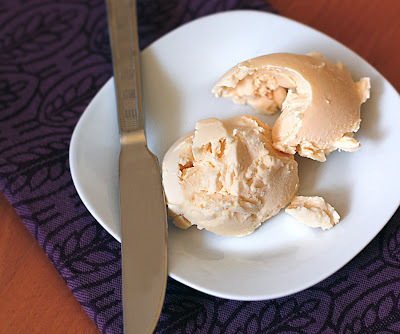 Buttah looks like a great alternative to the popular butter substitutes currently in use. BTW, The photo is for illustration only. It is NOT buttah. I haven't made any yet but am intrigued. When Mary Ellen from Book Publishing Company (The Farm, in Summertown, Tenn.) offered to send me a review copy of The Allergy-Free Cook Bakes Bread, a gluten-free baking book, she caught me at exactly the right moment. 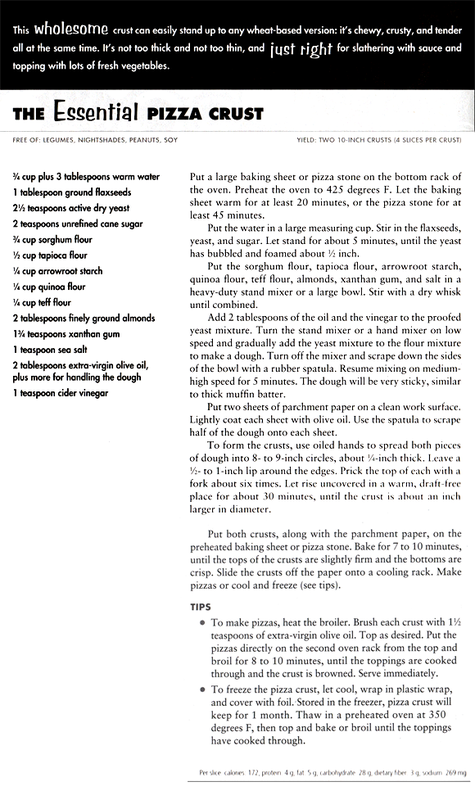 (If you're not so interested in GF baking, read on for the taco pizza, which can be made with a crust of your choice.) I've been eating gluten-free for about six months, and although I didn't find the change particularly noticeable in my general diet, baking is a whole other issue. I'd had a gross brownie failure, a successful cookie/cake experience, and a barely-OK bread-baking try. I was ready for something better. I don't bake often, and don't eat many sweets, but six months is a long time without baking something, even for me. 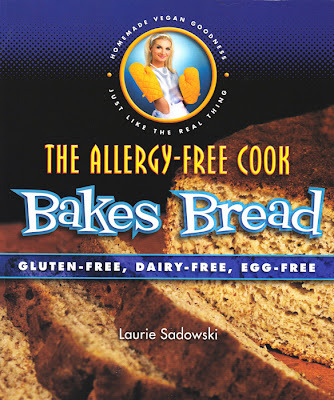 Because my experience with gluten-free baking is so minimal, I read Laurie Sadowski's book like a novel, from cover-to-cover. I appreciated her comparisons of the many kinds of flours, starches and other ingredients, her helpful information on how to customize recipes, her lists of substitutions, and her tips and techniques not just for baking, but for storing baked goods. Not only are her recipes gluten-free and vegan, she has accommodated just about every sort of food allergy you, or the friends and family you are baking for, might have. One of the things I like so much about the cookbook is the recipes don't seem to be as starch-heavy as many of the ones I've seen. Nor are they as dependent on large amounts of fat and sugar for their success. By the time I was ready to hit the kitchen, I was feeling much more confident. The recipes include everything from cupcakes, biscuits, doughnuts and scones to yeasted rolls, French bread, New York bagels, English muffins and pizza dough. (No cookies, though.) It was hard picking recipes to try, and I kept changing my mind. Finally, after seeing a post on Cadry's Kitchen about taco pizza, I knew what to do. I had to make pizza dough — the Essential Pizza Crust, to be exact. The raw dough patted into shape. It wasn't as hard to make a good GF pizza crust as I expected it to be; Laurie's directions were so helpful. I knew exactly what to expect from the dough at each stage. I might even go so far as to say making the crust was easy. There was one big thing I didn't do according to the directions, and maybe the crust would have been even better if I'd been able to make it exactly as described. Laurie lists a heavy-duty stand mixer as a required piece of kitchen equipment, and I don't have one in my current kitchen, so I used my food processor instead. The other small change I made was to bake the pie for its second baking rather than use the broiler. And here's a tip from me: when patting out the dough, oil your hands and use your palms to gently pat the dough into shape. My fingers stuck to the dough regardless of the amount of oil on them, but once I developed a "palming technique," it was easy to shape the crust. The dough after the pre-bake, just before I spread the sauce. One pizza was enough for two eaters, and the recipe makes two. After baking and cooling, I placed the leftover pizza on a paper towel-covered plate and covered it with foil before storing it in the fridge. The next night I added more sauce, more tomatoes and a few extra chips, and baked it on my pizza stone during the last 10 minutes or so of our roasted vegetable bake-time, or until it was hot. The crust bottom was extra crispy and the pizza tasted great. Next time I may be brave enough to use the stone for the second baking, rather than the parchment-covered baking sheet. I was afraid the crust would stick, but I don't think that will be a problem. The partially-baked pie before going into the oven for its second baking. I mentioned earlier that I based my pizza on this one. Cadry was trying to replicate a beloved flavor from her pre-vegan days, but I had no such constraints. 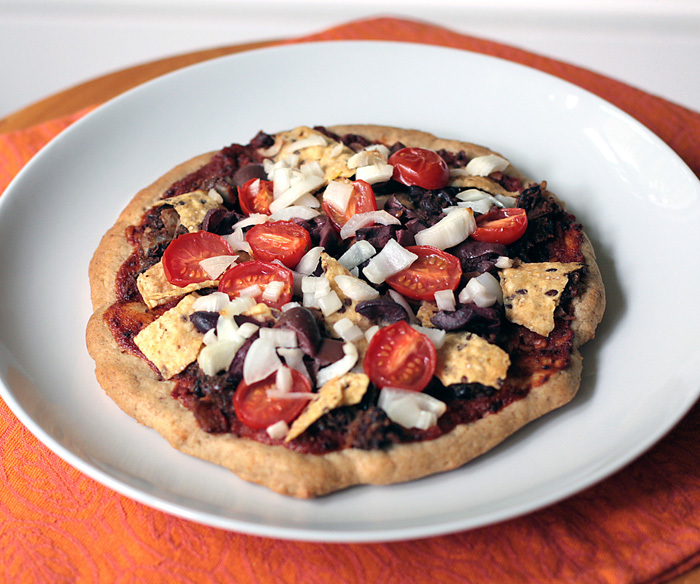 I'd never tasted a taco pizza, (and maybe I didn't even know there was such a thing! ), so I was free to create my own flavors. I cooked a pot of black beans, and turned them over to my husband to make Cadry's spicy black beans while I turned my attention to the crust and the other toppings. I used Bionaturae jarred tomato paste to create a sauce like my father had taught me to do with water, granulated garlic, onion flakes, oregano and salt. To give it extra taco punch, I added chipotle chile powder and a bit of yeast flakes. It was thick, spicy and tasted great. For the chips, I used ones we already had — Food Should Taste Good multi-grain tortilla chips, though Cadry's choice of Picco de Gallo chips from Garden of Eatin' would be the way to go if authenticity is key. I layered on sauce, beans, chips, olives, tomatoes and onions. (Cilantro, if I'd had some, would also have been included.) My husband and I loved our first taco pizza! 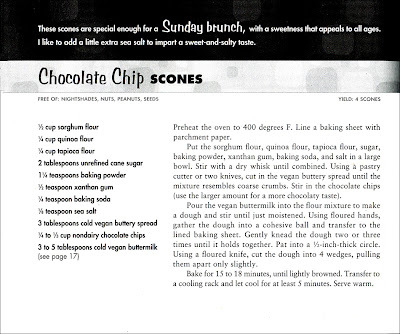 Allergy-free baking-book review part 2 will be about delicious chocolate chip scones. Thanks to Book Publishing Company for allowing me to publish the recipe. Full disclosure: The cookbook was provided free to me by Book Publishing Company. I was under no obligation to write a favorable review, or any review. I received no money nor promise of monetary gain. I am not an affiliate of this company. All opinions are my own.